Even if they attain their main goal, they'll still have to move. He's asking Star Trek fans to pay his personal debts. Total crook. It's a thin line of decency this crowdfunding lark... I remember the Axe Cop guy tried to kickstart his wedding once and on the Q & A there was a line like: "But you've just signed a deal with Fox and Dark Horse - surely you can afford to pay for your own wedding? Well yes, but the time that money takes to accumulate is longer than we can be bothered to wait. We want our wedding ASAP"
He's given up on the indiegogo. 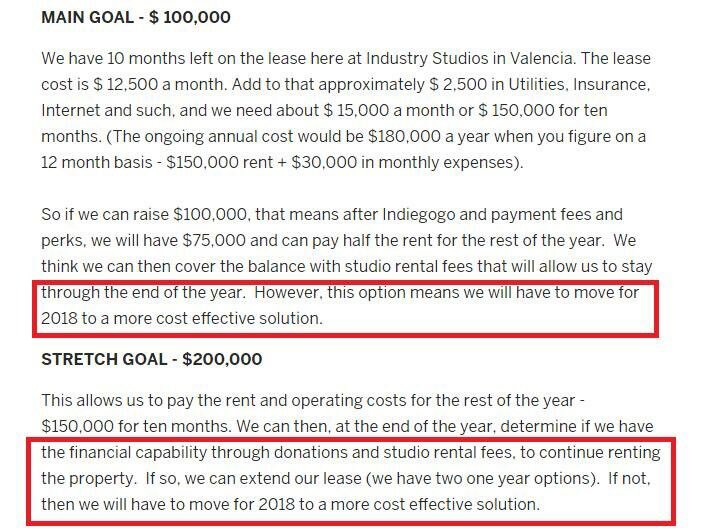 The facilities and the new studio he was trying to set up are being taken over by the Landlord. So not only have they ended up producing no film but also no studio from the original campaigns. $1.4 million well spent. Yeah, it's baffling - heard there was actually a bump in donations after this news broke. So he's got these half-finished sets which he's going to have to find a home for or junk, and burnt through $1.4m with one scene to show for it. The guy behind Prelude has washed his hands of him, saying that he warned him not to do this - and people still give him money?